Moved to Hatteras in 2002 from northern Virginia. Wanted to slow down and escape the hassle of city life. I still commute to northern Virginia for work and stay in Frisco during my time off. Met Leona in 2010 and we have been living together since 2013. She lives here full time and will be the host and guide for our guests. 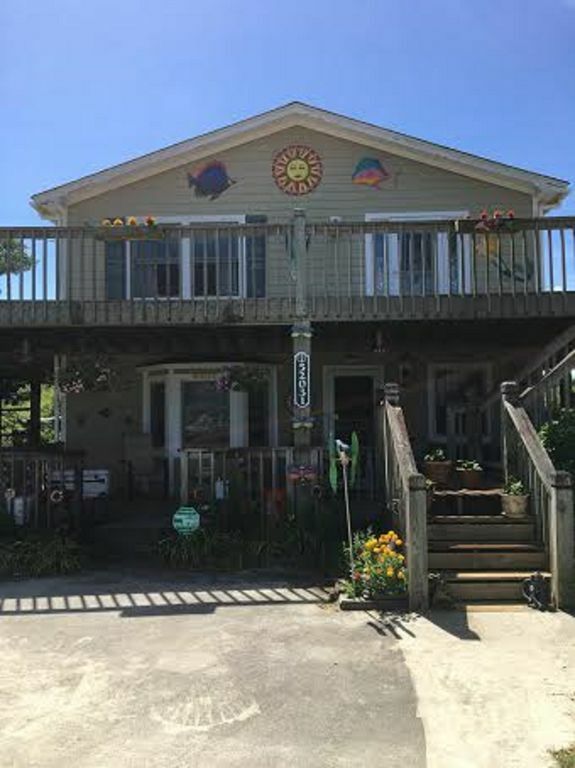 She is a native to Hatteras Village and is filled with great recommendations and local knowledge that can help make your trip! Live like the locals live and escape the hassle of the touristy neighborhoods while enjoying the central location of Frisco and quick access to all of Hatteras Islands adventures. Also, enjoy the comfort in staying in a newly renovated property that is new to the rental market as of May 2016. The close proximity to all the Hatteras Island activities while escaping vacation neighborhoods filled with noise, calamity, and vacationers! Our property is quite, large, and offers an opportunity to access everything you came to Hatteras Island to enjoy while offering privacy only enjoyed by the locals. toilet, combination tub/shower, Private to "Mermaid Room"
Beds must be stripped, and linens must be placed in dirty clothes in laundry room prior to checkout. All trash must be placed in the black trash cans @ the bottom of the deck stairs. Will provide Ironing Board @ guests request. 2 cars allowed, call if exception needed. Dirty towels must be collected and placed in dirty clothes in laundry room prior to checkout. Dining Room with dining room table that seats six situated on front of apartment. 3 1/4 acre partially wooded lot with lots of grass!!!! Wrap-around deck encircles entire living space. Treat our place as though it was your own. Take care of the property and the things in and outside. Clean up after yourself and enjoy your stay with us! Very clean & comfortable. Vince & Leona were great from check-in to check-out. Thank you for the good review ! Good reviews will get us more guests.Sorry I wasn't there to meet you all but Leona said you guys were great! Thank you for taking care of the upstairs. Come on back, Vince and Leona. Great place to stay! Relaxing and quiet. The owners are very welcoming and take very good care of the rental. Apartment is fully equipped with lots of extras for added convenience. Thank You Melissa for the good review! We were glad you all had a good time with some good weather. Hopefully this storm coming won't mess us up too bad so you all can come next year.Thank you and you all have a good year. Vince and Leona. The house was decorated with different themes in the rooms. Had plenty of space for our family of 4. Close drive to beach on the ocean but away from people. Hello Racheal, thank you for the good review ! Good reviews will bring us in more guests.Our goal is to be booked up maybe 8 or 9 months out of the year.Seems like some of the nicest, most down to earth guests are people from the Midwest.Glad you all made it back home from your journey safe and sound hopefully you all can come back if your ever back this way again. Anyways, thanks again, Vince and Leona. The place was perfect for me and my two teenagers! Very clean, has a lot of little extras, and good location in the heart of Frisco. The hosts were very accommodating and friendly. We will be back! Thanks David for the good review! My Maryland Peeps ! Leona and I enjoyed having you all stay with us.Glad you all made it to Ocracoke. We never get tired of going there as many times as we've been.Hopefully you guys can come back next year.Oh yeah, and thanks for cleanin up so well, Vince and Leona. Loved it! Very nice. Plenty of privacy but still close enough to town and the beach. Nice bedrooms. Roomy kitchen and comfortable living room. Loved the wrap around porch. Also got to see some local wildlife. The house was very clean and well maintained. Easy access to several points of interest. Minutes from the beach and Cape Hatteras Lighthouse. The hosts, Vince and Leona, were amiable and if you needed something they were happy to help. Great vacation and already planning for next year. Thank you Amanda for the good review ! We enjoyed having you all, ( My Maryland peeps ! ). Good reviews will bring us in more guests. Anyways, thanks again hope to see you next year, Vince and Leona. The property is tucked nicely on 3 1/4 acre partially wooded lot that rests quietly among natural pine forests in the heart of the village of Frisco. Frisco offers great diversity in accessing a variety of the amazing array of activities enjoyed on Hatteras Island. Only minutes to beaches, boat access, ORV access, fishing charters, parasailing, horseback riding, boat and jet ski rentals, surfing, fishing, swimming, paddle boarding, kayaking, nature walks, miniature golf, go-carting, shops, local museum, restaurants, the Hatteras Ferry System, and the world famous Cape Hatteras Lighthouse. Come enjoy the privacy and quiet of staying in a locals neighborhood that is only minutes from all your favorite Cape Hatteras past times. Come lounge around with us and enjoy all Hatteras Island has to offer!